Overall length of the small fixed blade Woodline is 8.7 inches, meaning almost two inches total was evenly trimmed from both handle and blade. At 5.9 ounces, the small Woodline also dropped about two ounces of weight -- if you travel where every ounce counts, that means a lot. Four inches of high carbon 8Cr13MoV stainless steel ought to be enough to handle anything up to the size of a whitetail if you're careful. With an edge hardness of 57-58 on the Rockwell scale, you can expect good edge-holding but should be prepared with a whetstone or diamond hone if working on something big. Since the Woodline doesn't have the usual SOG tactical style there's no false upper edge, and you can drive the blade with a wooden baton if necessary. The flat grind gives the knife more strength than a hollow ground style and still takes a razor-sharp edge for the fine work. There's also plenty of jimping on the spine for applying thumb pressure or fingertip control of the blade. The Woodline's unusual bead-blasted stainless steel bolster provides a deep finger choil for extra grip and gives the knife a distinctive appearance. 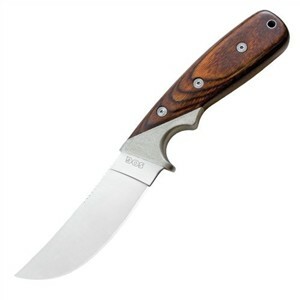 Instead of a rat-tail or full tang, here you get a blend -- a wide tang holds the handle slab fittings securely, but the hardwood grip fully covers the tang for a seamless look and a comfortable handhold. The Woodline includes a belt sheath of real leather, and with the sheath's security strap snapped, you won't need to worry about the knife getting lost. With the strap around the finger choil, the knife is securely locked in place. String a wrist lanyard through the heel of the handle for extra safety. See the Woodline Folding Knife if you'd prefer a compact version of SOG's new civilian survival blade.